Focal length is 206.6mm (F4.1) which is perfect for autoguiding a small refractor. The focuser has a 1.25" ID push-fit adapter with brass compression ring, allowing use of auto-guiding cameras or 1.25" eyepieces. The indexed micro-focuser can be locked, enabling the eyepiece or camera to set at the correct focus-point. Because the focuser does not rotate, the guide camera is easier to focus and maintain alignment on-target. The rear of the focuser also includes a T2 thread to allow the addition of extensions. The finder stalk is compatible with most finder scope brackets on the market, but also includes a universal finder bracket (product code UNIFBR), with a cross-slotted hole pattern to fit most telescopes. To attach the finder scope to dovetail bars, remove the stalk by means of the two set screws. NOTE: Eyepiece is not included with this model. 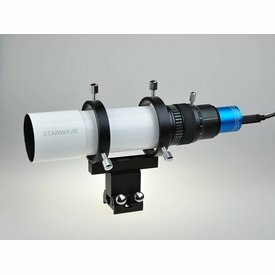 This kit enables you to auto-guide up to around 500 focal length scopes or even longer in the right hands.